Existing hotels can conserve energy, lessen their carbon footprints, and reduce utility bills through the use of the Hotel Room Retro-fit kit. The innovative device, invented by EnOcean, won honorable mention in the “Green Building” category of the recent 2009 AHR Expo Innovation Awards competition. 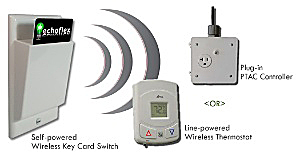 The kit features a self-powered wireless hotel key card switch that transmits a signal to a controller that turns on the lights and HVAC system when a guest enters the hotel room. Then, when the guest leaves the room and removes the key card from its dock, the power-consuming amenities are turned down. This will reduce energy consumption by up to 40%! BusinessWire has the full scoop here.